Steep, bumpy trails, regular crashes and rolling around in mud might be a far cry from cyclists parading down the Champs-Elysees with champagne but, according to eight-time British champion, Helen Wyman, cyclo-cross "is one of the most fun things you can ever do". Taking place in the middle of winter, the sport is road cycling's ugly sister. 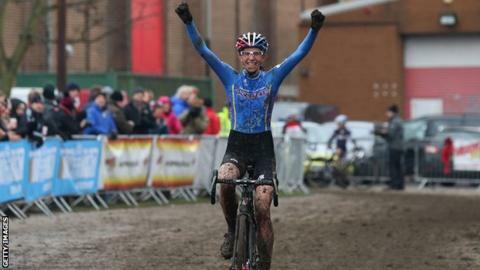 In February, Wyman captured the first British women's medal at the Cyclo-Cross World Championships since 2000, taking bronze in the Netherlands. "It's in the middle of the winter, you get muddy; you ride on sand, gravel; you pick your bike up; run up steps and up and down banks," beams Wyman, 33. "You just ride as fast and as hard as you can." Wyman comes from a family of cyclists. Her grandparents used to ride a tandem from London to Brighton at weekends with her dad as a baby in a sidecar. She started road racing at the age of 14, but when a physiotherapy degree started eating into her summer breaks, she took up cross as a winter alternative. "I was fourth in my first national race at the age of 19," says Wyman, who still competes on the roads in the summer months and will contest the inaugural women's Tour of Britain from 7-11 May. "Then I went to my first World Cup that year in Belgium and someone asked for my autograph. I thought, 'Wow, I want to be involved in this'." Since turning professional at the age of 23, Wyman has competed in as many as 50 races per year during a season that runs from September to February. Her training features intense 40-minute rides to replicate the conditions of a cyclo-cross race, where the effort of riding on uneven terrain forces the heart rate to greater extremes than road racing. The range of surfaces requires a custom-made bike with a higher bottom bracket to clear obstacles and tyres with greater grip which are inflated to a lower pressure to give greater traction. One of the biggest challenges a cross rider can face is riding on sand, a factor which makes the annual Koksijde World Cup race over the steep sand dunes of a Belgian military base compulsive viewing. "That race is as tough as it gets," says Wyman. "Taking a corner takes some balls because everyone tends to end up in the same rut in the sand and you have to be so strong to keep control of your bike." Wyman and her husband-coach, Stef, now base themselves in Flemish-speaking north Belgium, where cyclo-cross is a national obsession. When the world championships were held there in 2012, more than 60,000 spectators attended the venue, while four million - two-thirds of the population - watched on television as home favourite Niels Albert won the men's event and Dutch road and cross superstar Marianne Vos captured the women's crown for the fourth year in a row. Two years later in Hoogerheide, Vos once again took the gold, with a mud-splattered Wyman pulling away from Belgium's Sanne Cant on the final lap to take bronze. "It was really special," she says. "I have been there or there abouts for years, but this year the weather helped me. I'm not as good on snowy, icy courses because they are a lot faster. I am better when you need a lot of power or a lot of mud technique. "At one point it looked like I was going to get fourth or fifth but, once I went past Sanne, there was no way she was going to come past me again. It was awesome." Traditionally, most of the media coverage, sponsorship and prize money in cyclo-cross has focused on the men's races but this year, thanks to the involvement of American sponsor Twenty20 Cycling, one of the sport's iconic races - Koppenbergcross - will become the first European Category-1 event to offer equal prize money - about £1,400 - for men and women. "For the biggest race outside of world championships to say women should get the same is huge," says Wyman, who sits on the International Cycling Union (UCI) commission for cyclo-cross. Wyman described the Koppenbergcross move as one aspect of a "game-changing" year for women's cycling, especially in the UK. On top of the return of the women's Tour de France as a single-stage race, the first-ever women's Tour of Britain is expected to draw big crowds to an event featuring most of the world's top teams. Vos and Britain's Lizzie Armitstead, the gold and silver medallists in the London 2012 road race, will both compete along with Wyman, who will line up in the British domestic team Matrix Fitness-Vulpine, run by her husband. "It will be first time since the Olympics that the best women in the world have raced in the UK, so I think a lot of people will come out to watch," she says. "It doesn't matter what your gender is, you can still become a professional cyclist, it is still 'cool' to do sport." Wyman is also hoping to inspire a generation of mud-racers on 29 and 30 November when Milton Keynes hosts the first cyclo-cross World Cup race ever to be held in the UK. "I don't know if I am going to focus so much on the worlds this year but I really want to do well in Milton Keynes," says Wyman. "All the best riders will be there - men and women - and the venue is so accessible for people coming to watch." Wyman knows the profile of cyclo-cross can only grow so far until it is included in the Winter Olympics. Current International Olympic Committee rules only allow sports that take place on "snow or ice" to feature in the Winter Games, but the UCI, conscious that the summer Olympic programme is already loaded with cycling events, is pushing for the wording to be changed to incorporate disciplines that take place solely in the winter months. "It won't happen in my career, because, even if it was approved, it takes eight years, but I think it would be a great showcase for our sport," says Wyman. "You don't need many cameras because it is a fixed venue and everything is the same for men and women. The highlights reel is brilliant, because you have lots of crashing and falling off."